Bee Propolis, 60 capsules (Premier One) - Penn Herb Co. Ltd.
Honeybees coat the interior of the hive with propolis to maintain a sterile environment free from mold, mildew and bacteria. Naturally containing flavonoids, propolis is intended to help provide nutritive support for a healthy immune system. Beehive products --honey, royal jelly, bee pollen and propolis--- have been used as food and medicine for thousands of years. Their healthful benefits continue to be valued today. NOTE: Honey bees produce propolis by collecting resins from trees and combine that with beeswax, pollen and their own amazing enzymes. 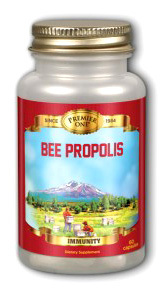 AMOUNT PER SERVING (2 CAPSULES): Bee Propolis 2x concentrate (equivalent to 1300 mg of fresh propolis). Other Ingredients: Gelatin (capsule), Maltodextrin, Carob Powder, Magnesium Stearate, Cellulose. Use only as directed. Take 2 capsules twice daily. BEE PRODUCTS MAY CAUSE AN ALLERGIC REACTION IN SOME PEOPLE. DO NOT FEED TO CHILDREN UNDER 1 YEAR OF AGE.